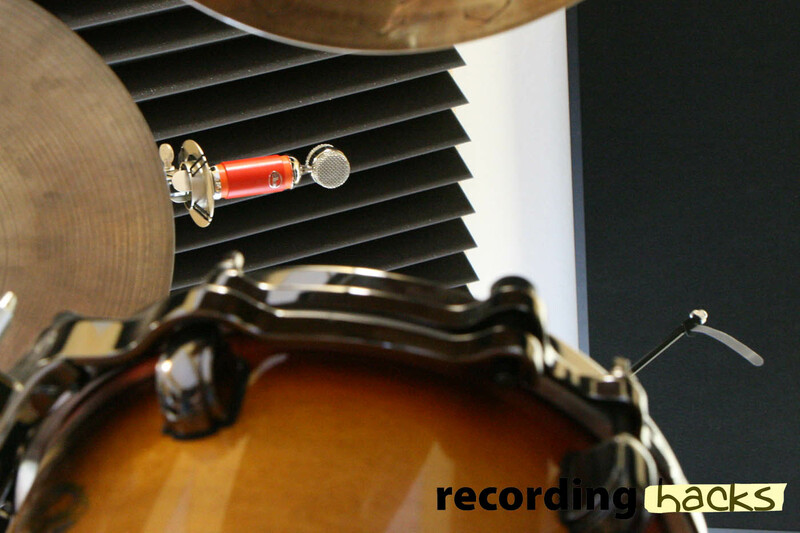 In this 3rd and final installment of our Best $200 Condenser feature, we hear nine different mics above a drum kit. Included as a neutral reference is a vintage AKG C 460 B small-diaphragm mic, modded by Audio Upgrades; this is a mic that really impressed me in the recent Prairie Sun Drum Overhead Shootout. 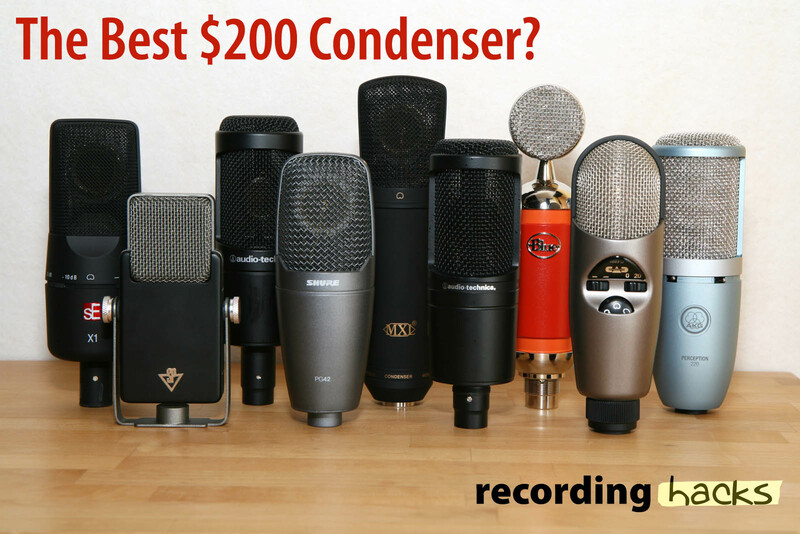 If you’re just joining us, we’ve invested weeks to test 9 of the most popular inexpensive large-diaphragm condensers. In Part I, we heard them on vocals, acoustic and electric guitars. In Part II, we heard them used for podcasting/VO. 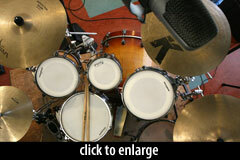 Read on for a torture test: drum overheads. All three parts let you listen blind to the audio samples. Leave your brand preconceptions at the door! Your unbiased ears will thank you. 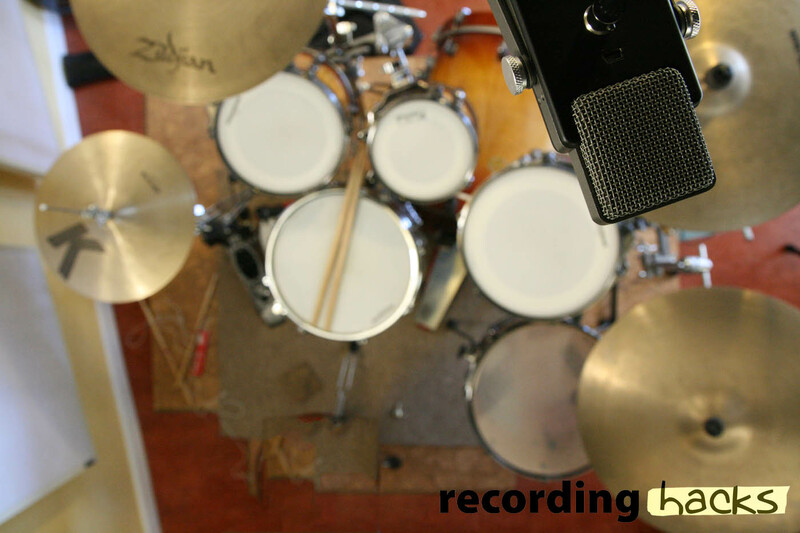 The 10 microphones in this test were positioned above the center of a drum kit, with each mic’s capsule at a height of 70.5'' from the floor. I recorded individual performances of a short composition that will be familiar to anyone who has listened to previous drum tests on this site. In all cases, onboard pad and filter options on the mics were disabled. The M179 was set to Cardioid. The Blue Spark was tested with and without the Focus switch; both tracks appear below. The same input channel of my BLA-modded Digi 002 Rack was used for all mics; its high-pass filter was enabled. Tracks were recorded at 24-bit, 44.1 kHz into Pro Tools, without processing. Gain levels were set prior to recording, to produce equivalent peaks across all mics. RMS gain levels were fine-tuned in Pro Tools prior to export of the mono audio WAVs, which were converted via lame to 320kbps MP3. I had only one of each of these microphones, so this is a mono test. Let’s begin with the reference mic for this set, the modded AKG C460B. It is a neutral sound, and comes across as fast, clean, and accurate. It doesn’t seem to perform any weird compression or EQ on the cymbals. The high-hats are defined and detailed without putting ice picks into my ears. 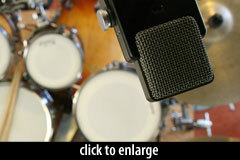 The kick drum has an appealing, tight thump, without being excessive or flabby. There isn’t a lot of tom work here to judge, but the few short fills sound realistically rendered. The M179 matches the C460B for tone, but records more of the sound of the room. The result strikes me as slightly less refined, maybe a bit more loose or organic. No EQ crimes are committed here, though. This mic remains a solid choice, and its reputation as capturing sounds neutrally is again proven here. The AT2020 stood out in a blind listening pass, because it sounded so bright and splashy, with an anemic low end. It comes across as scooped, because the high end is so exaggerated. I didn’t care for this mic in this application. The sE X1 turned in a usable track. I found the high end to be somewhat over-bright and borderline piercing, but it is balanced somewhat by a full low-end. I’d be inclined to lower these mics, moving them closer to the drums and putting the cymbals off-axis, to create a more appealing EQ profile during tracking. The Spark with Focus enabled sounded bright and thin on this track, and the high-hat comes across as painful. Also there’s a buildup of sound in the high-mids that colors the track in a way that I’m not sure I would appreciate at mix time. When I A/B between this and the C460B, the C460B track sounds like a relief — more balanced, drier, and three-dimensional. Without the Focus switch, the Spark turns in a more usable track. The high end is the same, and I find it exaggerated and fatiguing. But the mic’s low frequencies here have not been stripped away by the Focus switch, and the result is more balanced. I would definitely need to reposition the mic and possibly also EQ the track to reduce the HF, though. The PG42 stood out in my blind listening as one of the more appealing tracks. It is very very bright, to be sure, which sometimes kills a track for me. But this one didn’t seem sharp or shrill. 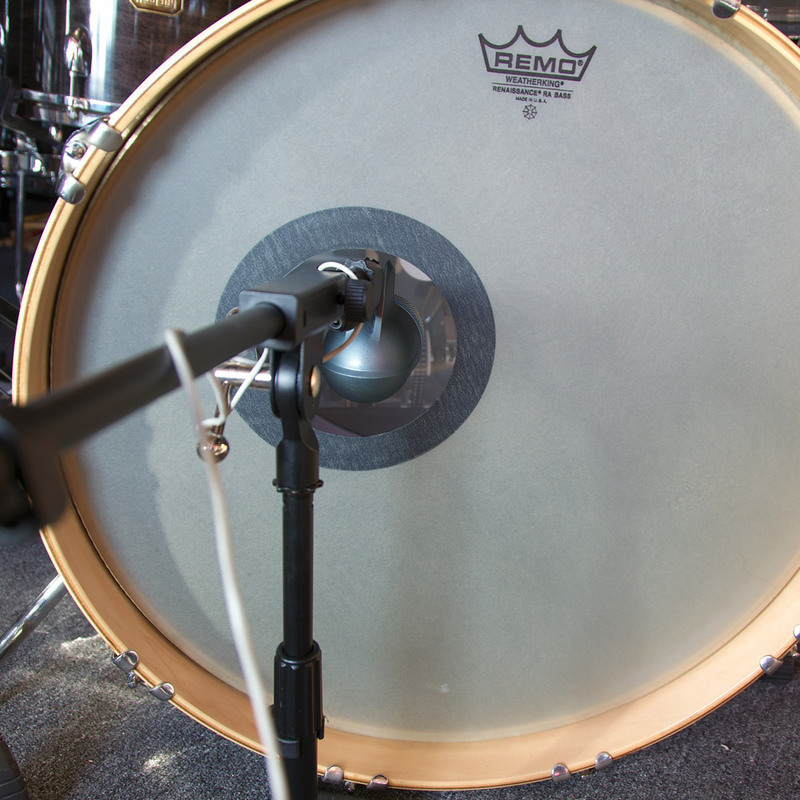 The snare is punchy. The overall tonality is balanced. As with the X1, I’d probably like these mics even better in a different position, where they’d pick up more of the drums and less of the cymbals. The Perception 220 put forward another strong performance in this track. It is every bit as balanced as the C460B. The high frequencies aren’t exaggerated or harsh. The lows are full without booming. Nicely done. The MXL 2003A sounds remarkably like the sE X1 in this test: borderline too bright, but balanced by the low end. Despite these being two different performances, a frequency response analysis of the two tracks reveals them to be all but identical above 50Hz, with the X1 being 1-2dB brighter between 5kHz and about 12kHz. In short, the 2003A captured a nice picture of the kit, with a muscular low-end that drives the track forward. In the future I would work on the mic position to deemphasize the cymbals, which otherwise can end up being exaggerated. The AT2035 sounds good here, perhaps a bit thinner in the low end than would be ideal, but restrained enough in the highs that the cymbals don’t get out of hand. 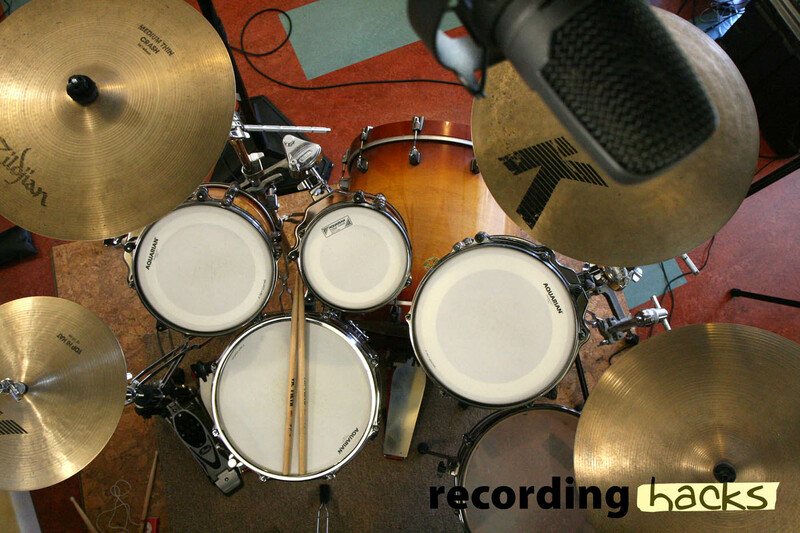 As with some of the other mics here, a placement that focused on the drums (at the expense of the cymbals) would probably work in these mics’ favor. Even as recorded here, though, the AT2035 had nice detail and a balanced sound. 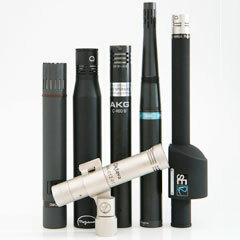 The LSM stood out in a blind test for having the best low-frequency extension of all the mics in the test. Listen to the kick drum! A frequency comparison reveals that the LSM captures more energy below 60Hz than any other mic in this test. Do an A/B test with the Spark/Focus track, which has most rolled-off LF response. The difference is huge. Whether all that low end is appropriate for an overhead track is a matter of personal preference. Certainly you could roll it off on the pre, or at mix time. But it’s sure there if you need it! Personally, I think the LSM track sounds great. It isn’t neutral or uncolored, but it’s also a sound I don’t otherwise have in my toolbox, and worth having for just that reason. I wish I’d thought to stick it into the kick drum before sending it back. I bet the LSM makes a phenomenal kick-drum mic. Most of these mics turned in usable tracks. If you factor in adjustments to mic position, and mix in close mics on kick and snare, then nearly all of these microphones would be fine in this application. But the reality is that many of the other mics turned in equally usable tracks: the Audio-Technica AT2035, sE X1, MXL 2003A, and CAD M179 all sounded very good here, and I would not hesitate to use any of them. By now we’ve heard most of these mics in Aaron’s test of vocals, guitar cab, and acoustic, and all of them in my voiceover/podcast roundup. Let’s summarize. The AKG Acoustics Perception 220 sounded good on every source we put it in front of. That makes it a genuine workhorse mic, at an extremely reasonable price point (currently $130 at Amazon; click the image at right to see current sale prices on this mic). The Studio Projects LSM was a surprise performer. Given its onboard ADC, USB output option, and built-in desk stand, it seems Studio Projects has targeted new home recordists rather than established studios. But overlooking the LSM for these reasons would be a mistake, because it is a unique little mic that I think would see frequent usage in any studio. It isn’t the most neutral mic of the bunch, but it’s one of the most exciting. I think Studio Projects has a real winner with the LSM. CAD Audio M179 – a top pick in the VO/podcast test, and a strong performer in the drum OH test. It’s the only multipattern mic here, and IMO is a fantastic bargain. Audio-Technica AT2035 – sounded great in the podcast/VO test and on drum overheads. 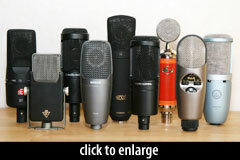 For my $200, I think any of these five microphones would be a reliable addition to the mic locker. They’re not all interchangeable, of course, but we’ve given you enough real-world usage notes to make an intelligent decision about which might serve you best… and even some ideas about how to use them to get the most out of each. The MXL 2003A and Shure PG42 are perhaps a bit less versatile than these other mics. With careful placement, though, they’re good performers. We have no affiliation with AKG, Audio-Technica, Blue, CAD, MXL, sE Electronics, Shure, or Studio Projects; we received no compensation for this review. 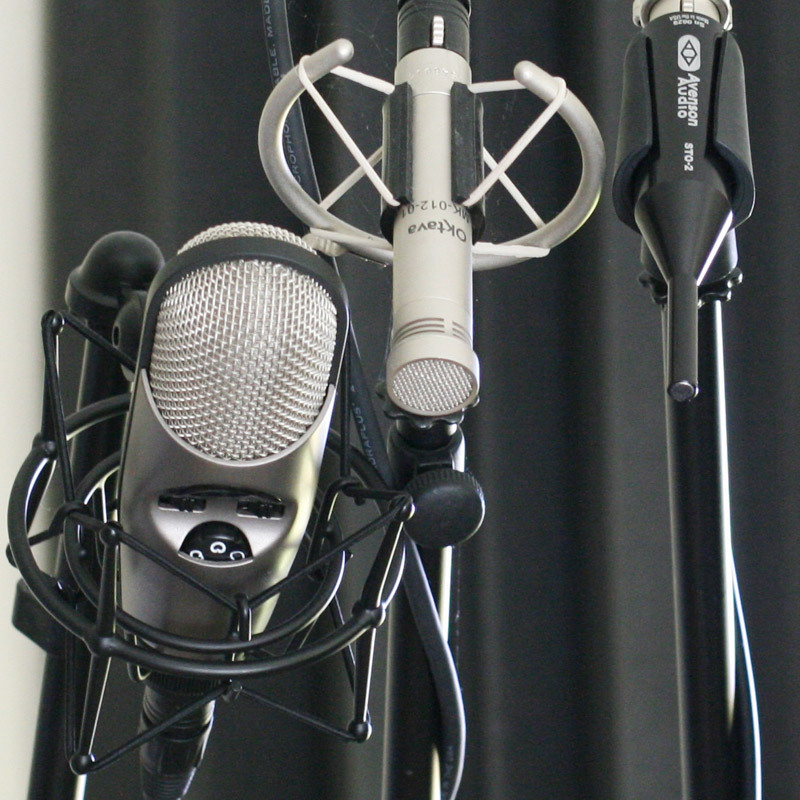 The CAD M179, Audio-Technica AT2020, AKG C460B, and AKG Perception 220 are personal property; the other microphones were loaned by their respective manufacturers for the purposes of evaluation, and have all since been returned. I’m interested to hear your experiences, especially if you already have one of these mics and you think we’ve got it all wrong. Also, if you buy something based on this review, definitely leave a comment so we know how the mic is working for you. You might also be interested in this followup piece comparing the Rode NT1-A to the sE X1 on acoustic instruments and voices. If you’re shopping, please consider purchasing through one of our affiliates; the meager commissions we earn help us continue our work on this site. There’s not much more I can add about the AKG Perception 220 except that I’ve had it for over 2 years and it keeps on giving my VO’s the sound I want. Matches nicely with a tube preamp. I only switch to a dynamic for hard sell high energy stuff. Some folks might find it a bit too warm for their taste, but a touch of EQ can take care of that. Don’t let that baby blue color fool you. It’s a solid-built serious workhorse mic that makes money. My local dealer has been trying to sell me a CAD M179 for years. Guess he knows what he’s talking about. Nice drumming and room sound! The only thing I would add is the CAD M179, in standard cardioid, has a wider pick up pattern than pattern most other mics. I have to dial mine down, between cardioid and hyper, to get what I would say is a standard pattern. 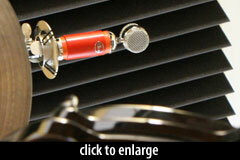 It’s great that this mic lets you do that. For Steve Fauls comment, seeing this mic for $129.00 almost everywhere, you can’t go wrong, very low noise, versatile and great sounding, how CAD sells them so cheaply is a mystery! Please excuse “pattern” after than! I noticed the “Recording Hacks” link to the M179 shows the old specs for the mic. With spectrum analysis, mine goes below the manuals listed 20hrtz, but the manual also lists the mic as going down to 10hrtz on the frequency graph. The additional room noise you might be picking up are sub harmonics and wider pattern. I may have a newer version, as I picked mine up in December, after the VO shootout. i’m still new to recording so I can’t offer a lot in the way of experience. Having said that, the MXL V67n is a great cheap condenser. It picks up cymbals really well but is able to pick up a whole kit nicely. Hope I didn’t miss a post you reviewed it in. Check it out, for a US$120 you won’t be sorry. Really good for guitar, too. I found this review extremly helpful. In fact, I went out and purchased two(2) Blue Spark microphones for my overheads. The toms are so beefy and clean I don’t need to close mic them. Anyway, thanks. Just wanted to say thank you for putting these blind tests together. These have been really useful for me. I purchased a pair of AT2035 after reading this, and I have been really happy with them. My only complaint is that they are so natural (in a gentle or relaxed sense) that I want something with more ‘character’ sometimes. But I have yet to hear anything under $500-600 that sounds even twice as good, let alone 3 or 4 times as good. I even like them more than my AT4050! I guess it’s not the price, but what they sound like for your uses. 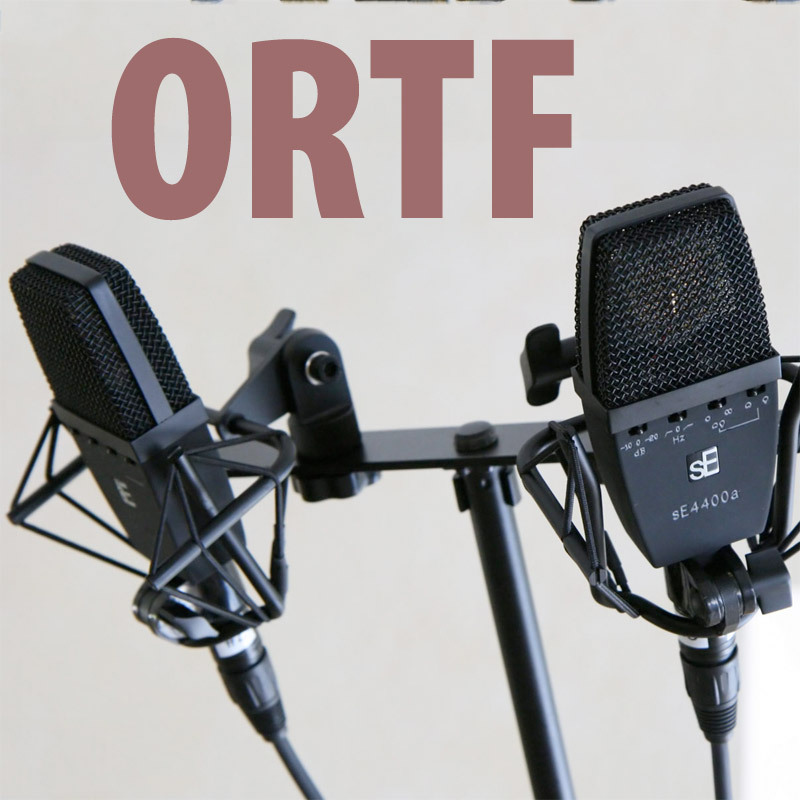 As an ORTF pair (for $300!) they were good enough to track an entire album of acoustic folk songs – and the client was thrilled. Because I need multipattern (and I’ve learned through this website that price is no indicator of sound) I’m all set to get some CAD m179s that I have been sitting on the fence about for years. They sound very similar in these tests – natural, but a gentle representation. Thank you! This was exactly what I was looking for! I have always used a minimalist approach to recording drums and I have been wanting to find a new mic that gives me the biggest bang (pardon the pun) for my buck. I did the blind test and narrowed it down to #6 and #11. I was pleased and surprised when their id’s were revealed. About to place some orders. Thanks again! Could you please explain why you used the high-pass filter on your recording interface for this test? I usually record my drum overheads flat. @Michael – Either way is fine, I think. I would normally have close mics on the toms and kick, and in that case I don’t need a lot of low frequency info from the OH track… and if I’m going to roll it off in the DAW anyway, there’s no harm in doing some of that EQ during tracking. Thanks, Matthew, that makes sense. I was listening to the clips, attempting to evaluate which mic would work best in a minimal (mono/recorderman/glyn johns) setup. I thought they all sounded a bit thin, especially compared to the clips in your AT4050 review (http://recordinghacks.com/2012/04/23/at4050-review/ that M-S sounds great!). Now I understand why, so thanks again for the explanation!